Thanks to all who sent me good wishes on my last post. I appreciated all your kind thoughts! 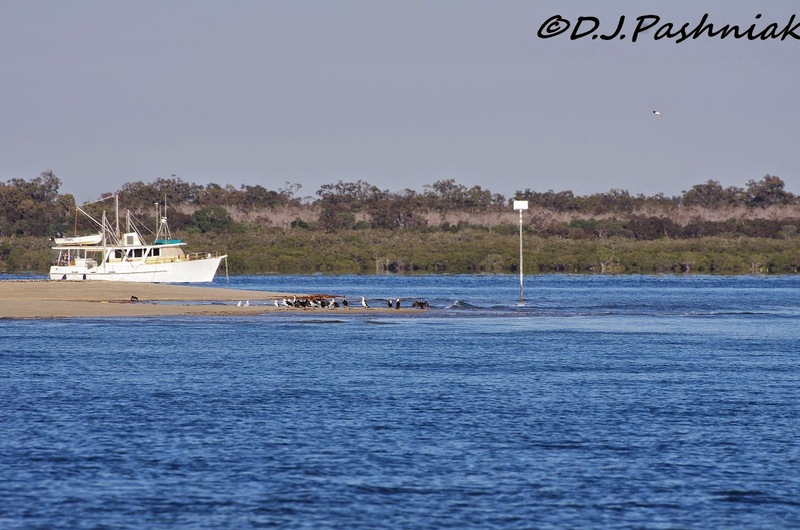 Yesterday morning was beautiful and it was even more beautiful out at Inskip Point. The hint of frost on the dry grass in my yard was nowhere to be found out on the sea coast. It was sunny and very still - and because I was out early there were not too many people around to frighten off the birds. As usual there were lots of boats around. This one looked as if it had been anchored on the other side of the sand island all night. 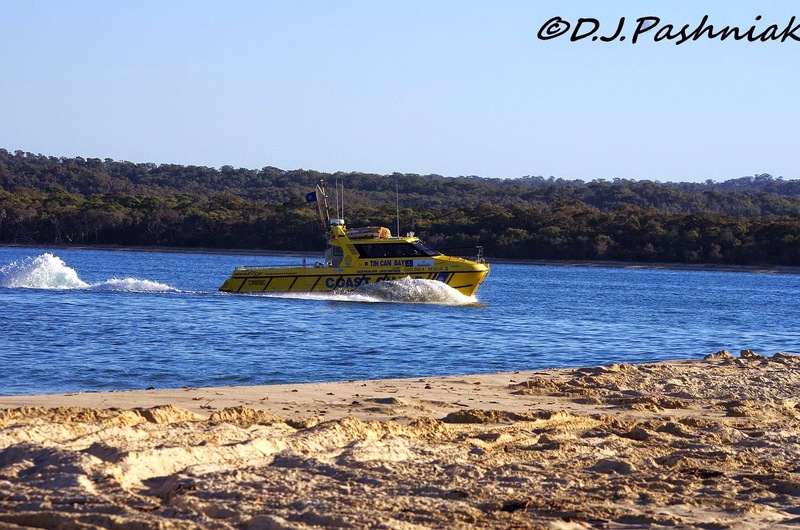 The Coast Guard boat was going out along the channel at quite a speed. 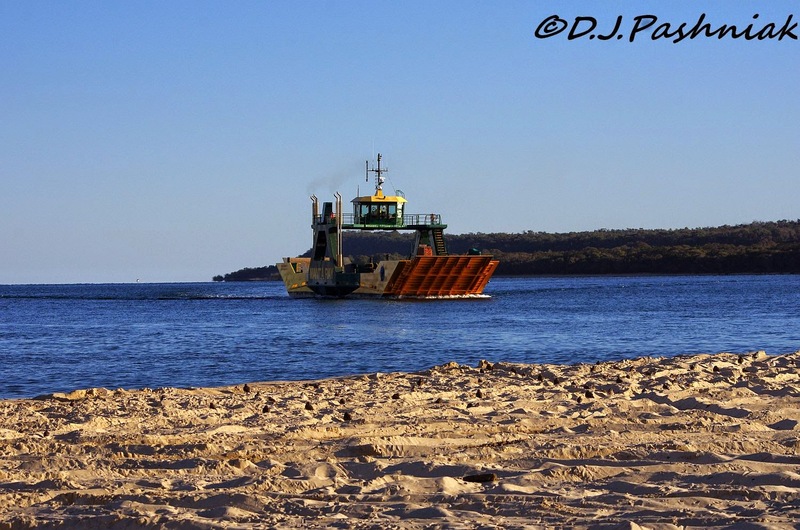 The barge to Fraser Island had already made one trip over to the island. There was very still water over at Bullock Point and the barge and other boats anchored over there seemed to almost float on air. As I walked out along the sand I only saw some pelicans and terns roosting right out at the end. However, a 4 wheel drive vehicle was going out towards the barge and it disturbed some little shorebirds that I had not even seen until they flew up. I watched carefully to see where they landed - it is a very big expanse of sand and these little birds have a habit of hiding down in car wheel marks. At first the only ones I saw were Double Banded Plovers that are getting ready to migrate back to New Zealand at the end of our winter. Some were already showing quite a lot of breeding plumage. A second vehicle going towards the barge made an even bigger flock of little shorebirds fly up and along the sand at the edge of the water. At this time of the year a flock like this will usually include Red-capped Plovers and Red-necked Stints as well as the Double-banded Plovers. They all seem to flock quite happily together and I have to look carefully to ID them all. Red-capped Plovers are year round residents in Australia. Red-necked Stints migrate to Siberia and northern Asia to breed in the northern summer. The ones here now will be juveniles not yet old enough to migrate. 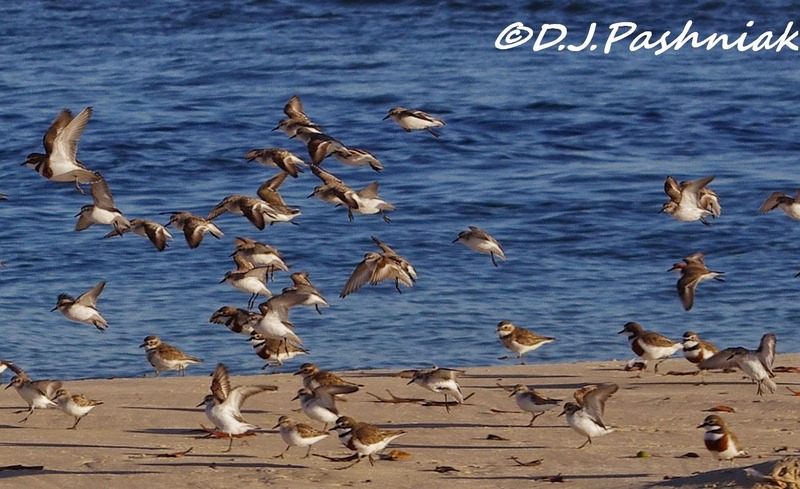 The birds in the front of this photo are all Double-banded Plovers. There are 3 Red-necked Stints out of focus in the middle back. 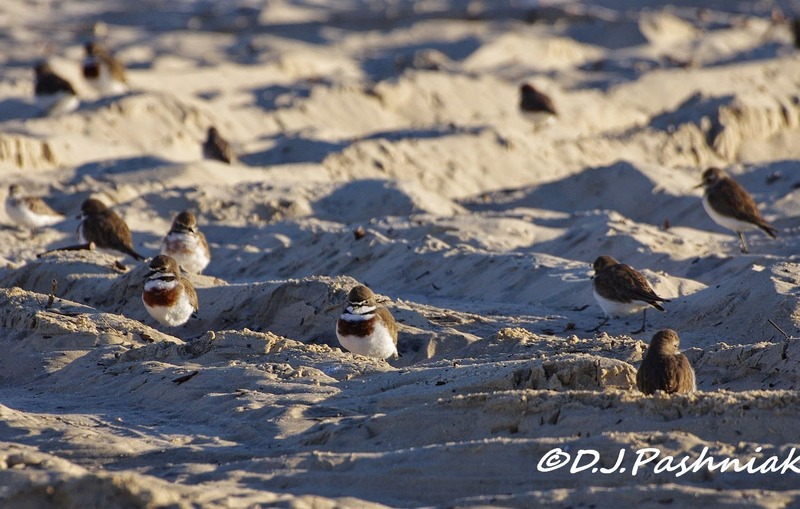 Two Double-banded Plovers in the front of this photo and two Red-necked Stints behind them. Another two Double-banded Plovers and two Red-capped plovers with them - a male and a female. Walking back to the car park it was not quite 8:30am and the sun was still low enough to wash the sea with silver and to turn the fisherman at the edge of the channel into a silhouette. beautiful blue waters and cute plovers. like that last silvery image, too. The species mixing like that certainly makes for demanding birding Mick. Likewise the vehicles along the beach moving the birds from where they want to be. It's undertandable how small waders can "disappear" into those car tracks from your picture. Your last picture is a real gem - not many people about then to spoil the shot. Wonderful captures as always, Mick!! Such beautiful blue water, lovely birds and I really love your last silvery image, breathtaking! Thanks for sharing the beauty! Have a good new! Gorgeous scenic views and I love all the birds. The plovers are so cute! Wonderful photos! Have a happy week! I liked that last photo very much. Have a good week. What a beautiful place to be a bird! I really like the photo of the plovers where some are taking off and some are still in the sand. And the one of the sun coming up is perfect. Wonderful shots - that last one is stunning! So many birds! So beautiful and great photos! Love the last photo! Hi Mick, beautiful scenery! Gorgeous water colour! Loving all those shore birds too! Sorry to hear about your eye problem and hoping the best for you! I know what it's like to have vision difficulties, with MS, it's a regular occurrence for me..
Super clear views from Inskip Point and thanks for seeking out those little waders amongst the sand. 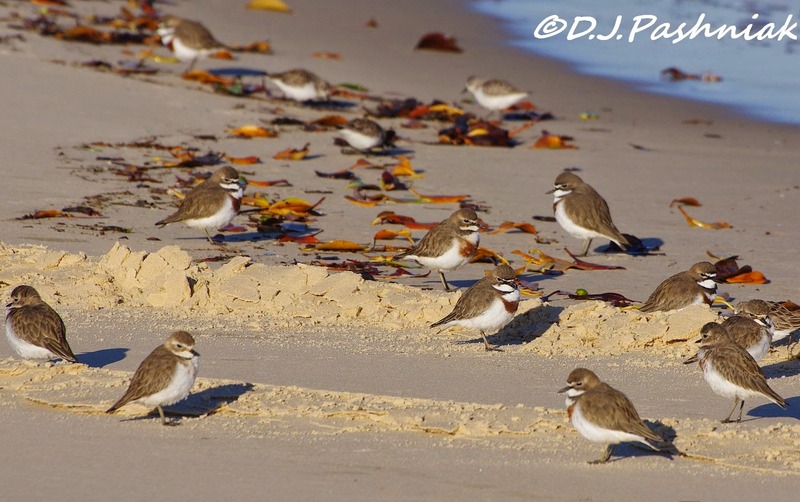 wonderful photographs of the Stints and Plovers. Beautiful place with so many cute birds. Great photos and beautiful birds, it's a nice area. Terrific shots of the lovely shore birds. Lots of action! looks like a fun trip -- always great to see so many shorebirds! The double-banded plovers are beautiful! I am yet to see these! great photos. Those Double Banded Plovers are gorgeous Mick! I have never seen them before. I'm always so interested in what you capture up your way and find myself constantly wishing that we had 4WD so we could explore the area better. It must be wonderful to get amongst the shorebirds as much as you do. Michael & I would love to head up your way again this year but I'm not sure we will make it unless we can get away for a weekend but then there will be the issue of transport to see the shorebirds. I really enjoyed reading your post, Mick (did it twice). It's amazing how those little shorebirds can hide "in plain sight". We seldom get a chance to see very many species in breeding plumage so your photos are really special for me. Just the scenes of the water and shore make me want to head for the beach - and I was just there yesterday! Lovely birds. Because we're originally from Oregon where driving on the beach is prohibited (one of the few US states maybe the only one) I would have at first thought it was sad that those jeeps were driving on the beach... except it seems like it did make for great birding opportunities. And interesting that they hover down in those tire ruts.